Sir Theodore Wilson Harris is a celebrated Guyanese writer and a visionary explorer of the interdependence among history, landscape and humanity. Born to an insurance agent and his wife, Harris studied at Queens College in Georgetown, Guyana. He became a land surveyor and, in 1955, the government’s senior surveyor. The years in Guyana’s interior were formative, giving Harris a sense of endless forests, the vast Amazon and the Amerindian peoples. “The interior of Guyana came alive to me, and seemed like another planet,” he has recalled, describing “the great waterfalls and trees – so different from the coast where I was born.” He was mesmerized by a landscape that seemed both alive and mysterious, as well as by the traces of pre-Columbian inhabitants. 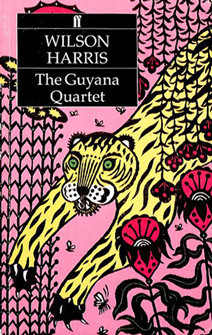 Harris began writing poems and essays as one of a group of Guyanese intellectuals. He published his poetry under a pseudonym and began exploring cross-cultural currents that link the Homeric to the Guyanese. In 1959, Harris left for England to become a full-time writer. It took him three attempts at a novel – all of which he destroyed – before he was satisfied with Palace of the Peacock, published by Faber & Faber in 1960. The editor who approved it was T.S. Eliot. The story centers on Donne, who is leading a crew upriver to bring back Amerindian labor. A series of tragedies brings about the death of each principal character, which Harris uses to highlight the superficial illusions of opposites that separate the men. Harris went on to write 24 more novels, all published by Faber & Faber, all written in longhand with pen or pencil on paper. His fiction, dense with symbolism and sensuous imagery, has little in the way of conventional plot or character. Instead, it draws on dream, myth and archetype – and is often enigmatic. His ear for dialogue is acute. Knighted in 2010 by Queen Elizabeth, Harris has been awarded honorary doctorates by several universities, including the University of the West Indies (1984) and the University of Liege (2001). He has twice won the Guyana Prize for Literature.